I had the opportunity to sit down with Jennifer Grayburn and Alex Wermer-Colan, Temple University’s postdoctoral CLIR fellows. Both Jennifer and Alex work in Paley Library’s Digital Scholarship Center (DSC). Our conversation aims to demystify the DSC with the hopes that you’ll stop by and inquire about tools and techniques that can add value to your research! Below is the first of a two-part conversation. First, we speak about their background in digital scholarship and tackle a few key terms. Stay tuned for part two where we’ll explore the fellows’ research and the idea of digital scholarship within the library ecosystem. You are both CLIR fellows here at Temple’s Paley Library. What is the CLIR fellowship, and what makes it distinct from other postdoctoral fellowships? Jennifer: CLIR stands for the Council on Library and Information Resources. The CLIR postdoctoral fellowship was one of the first to place academically trained, PhD graduates in library and technology fields. It is becoming increasingly common for PhDs to be hired in libraries. Alex and I are both on the Academic Library track. The idea is to conduct our own digital research, most likely related to or a continuation of our dissertation, as well as contribute to the logistics and intellectual life of the DSC. Alex and I both spend 50 percent of our time researching our own digital projects and the remainder of our time goes towards managing workshops, consultations, supervision and mentorship of graduate students, and the annual DSC project. This year, we’re digitizing science fiction literature for textual analysis. Postdoctoral fellowships can vary. Many academic fellowships have teaching and research components. This is an alternative-academic (alt-ac) fellowship. Postdoctoral fellowships generally target those that have just finished their dissertation and the library uses the opportunity to support young scholars while also diversifying the specialties within the DSC. Alex: More and more, postdoctoral fellows have a strange relationship to the university. Postdoctoral fellows are taking on positions that previously would have been tenure-track positions; in some cases it becomes an avenue to compensate for underfunded faculty positions. In a lot of postdoctoral positions you have less of a sense of how you are part of an institution. CLIR is about giving fellows time to continue their projects, but also allowing them to learn from, and contribute to, institutional systems like libraries. There is an emphasis on bringing people into positions where there is a space for pivoting. If you had to describe the Digital Scholarship Center to a returning English professor who has spent the past several years, unplugged, hiking across the world, how would you go about doing so? Jennifer: The Digital Scholarship Center fosters the use of digital tools and methods in disciplines that don’t traditionally use them. The humanities are often targeted because traditional training within these disciplines has not included computer or digital analysis. Alex: It’s about finding out what their research interests are, then finding possible tools and techniques that can help them. 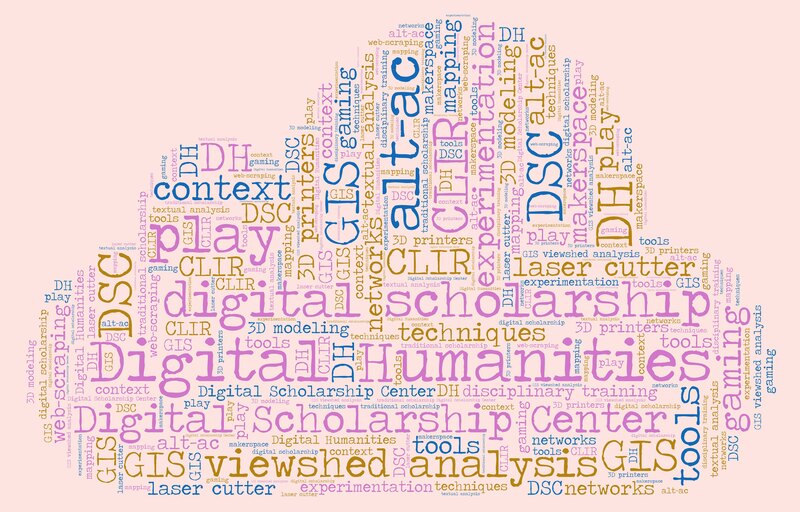 In the DSC we integrate many digital tools and methods into humanities fields. For example, in literature, that can mean building databases, digitizing texts, and using tools to look at texts in a more efficient, and still complex, way. I’d try something like asking the person their favorite quote in a book. If they struggle to find it, I’d use that as a wedge to introduce them to tools that would facilitate that process, while showing how that’s just the tip of the iceberg. Frequently people are introduced to digital scholarship without a sense of how the tools can be used. Some people don’t know what questions they’d want to ask given the tools at their disposal. Perhaps if they have the tools first, they’d be amenable to asking, “what new questions can this help me answer”? What are the digital humanities? Is it a bit of a misnomer, in that, are the tools and techniques only applicable to fields in the humanities, or are they more broad reaching, for example, to the social sciences or interdisciplinary fields? Jennifer: The Digital Humanities (DH) was conceived as an approach to the humanities that takes advantage of computational methods that have been used in other fields, like computational linguistics, for decades. There has been a lot of debate about what does and does not count as “DH” and it has in some ways developed into a separate field with its own historiography. I am more interested in what Eileen Gardiner and Ronald Musto describe as the ‘digital humanities’ (lower case plural): how scholars apply the bits and pieces of digital methods that fit within the context of their own disciplinary field and research questions. A lot of social sciences train their students in statistics and other computational methods within their discipline, so we mostly support students and researchers in fields that don’t get that type of training within their department. We also get a lot of students who might be considering alt-ac careers that require a diversified skill set. I use digital tools to pose and answer questions to my field of architectural history. In the case of using GIS Viewshed Analysis, the visualization doesn’t give me a definitive answer. The digital output gives me a new artifact that still needs to be interpreted. That’s where your disciplinary training and critical thinking comes into play. Is there a good and bad way to do digital humanities? Some have accused it of word-counting, is that view completely off? Jennifer: To learn you have to start somewhere. I appreciate that many DH communities value experimentation. There has even been an increased commitment to gaming and play as part of this process. Anyone who attempts to play with their data in new ways is learning and adding value to their research. While I wouldn’t call it ‘bad DH’, I would argue that using technology for technology’s sake, so people doing something with a computer when it’s not needed or it doesn’t supplement anything or answer any questions, is less helpful. Still, you have to start somewhere. I tend to be more inclusive with digital humanities because many fields are still trying to figure out their relationship with technology. Alex: On that last point, it’s frequently a question of what’s good or bad scholarship, more generally. A lot of the time a project sets its own standards. The real problem would be if the project doesn’t justify its need, or if it doesn’t fulfill anything it promises. There’s also a difference between someone who is learning and experimenting with these new tools and someone that uses tools for advanced research, but doesn’t justify why, or make their results relevant to larger questions. A problem people face when coming into a Digital Humanities/ Scholarship Center is the intimidation factor brought on by certain famous people or project that give the impression that they could never understand technology or use it like those big names. It’s a mental obstacle, this false sense of mastery. Anybody can learn how to use new technology, but for most it requires perseverance. It’s also important to remember these approaches aren’t replacing traditional methods. If I’m doing a distant reading project, looking at a large set of texts, I’m still going to read as many of those texts as closely as I can, to present individual quotes along with data visualizations. A lot of the time DH involves bringing methods from media studies into English and/or sociological methods and perspectives into history. Digital technology, at its best, facilitates important interdisciplinary research and pedagogy. What are your respective roles within the DSC? How does the CLIR fellowship and working in the DSC contribute to you development as new scholars? Jennifer: We mentor graduate student externs and digital scholars, as well as hold consultations and workshops within our fields of expertise, mine being 3D modeling and makerspace fabrication. I’ve done a lot of outreach in digital pedagogy, or using digital tools and methods in the classroom. One of our major initiatives this past year was the introduction of the Innovative Teaching with Makerspace Technology Grant, which we co-sponsor with the Center for the Advancement of Teaching (CAT). The fellowship has given me the time and the resources to think critically about my own digital projects. It has also provided me with the opportunity to share my research and methods through conference presentations and publications. Alex: Receiving the CLIR fellowship and getting to work at Temple has enabled me to learn a lot that would never have been fostered otherwise, if I had continued working as a teacher, or really in any other capacity. Both being put in a position to work on certain projects, but also being given a huge set of resources, has helped me to grow in my approaches to academic research and pedagogy. If I had to specify my role, I’m working primarily in a field increasingly referred to as “cultural analytics,” focused on practices like web-scraping, computational textual analysis, and mapping. Besides a growing interest in the educational uses of virtual reality, I’ve also been learning to run the communications wing of the DSC. Most importantly, it’s been a real privilege to work with faculty and graduate students to build collaborative research projects. I’m finding myself primarily interested in how to structure and develop collaborative projects that involve active learning for everybody, especially for students at different levels, so undergraduates can contribute to research projects directed by graduate students and supervised by faculty, working together to produce and share new knowledge. Stay tuned for the second part of our conversation!